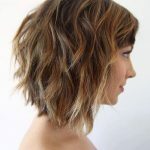 Simple easy daily short haircut: Thick hair is getting a lot of attention right now, with the huge range of smooth and groovy, chin-length bobs that are renewed and re-freshed for every season! This short haircut has lots of forward movement and texture showing off the sliced layers that work so well at controlling thick hair types. This short haircut has an eyebrow-skimming full fringe, with lightly textured tips and a graduated profile, making a well-groomed and flattering face-frame. The rest of the bob hair is carefully graduated at the very ends to make a ‘bevelled edge’. 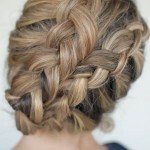 This encourages thick hair to form a natural curved-in shape, that’s very easy to style and stays in shape all day. The rich, warm auburn in this style is cleverly enhanced with half-way copper highlights that run down to the tips and draw attention to the front sections in a soft point at the jawline. It’s a short hairstyle that’s feminine, with a lovely rounded silhouette, but not fussy and a great way to show of thick, glossy hair! The dark red is hot recently, if you don’t like this hair color, how about the ombre hair colors? Check it out here : 90 Hottest Ombre Hairstyles for Women – Ombre Hair Color Ideas.